NPR's read on the statement was that it didn't confirm or deny the reports, and the late morning was filled with conflicting reports regarding what portion of the troops would be coming home and when. Hours later, NPR reported all the troops will indeed come home, and that a drawdown in Afghanistan is being weighed too. AP similarly reported all troops were leaving, sourcing its report to an unnamed official. Still, there has been no official confirmation of this. The Pentagon initially just said that "we continue to work by, with, and through our partners in the region." It later confirmed at least some troops were coming home. Its statement: "The Coalition has liberated the ISIS-held territory, but the campaign against ISIS is not over. 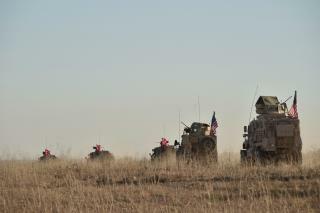 We have started the process of returning US troops home from Syria as we transition to the next phase of the campaign." The BBC reports the Pentagon would not detail that next phase "for force protection and operational security reasons." Speaking of confusion, the AP notes what the US special envoy to the anti-ISIS coalition, Brett McGurk, had to say last Tuesday: "I think it's fair to say Americans will remain on the ground after the physical defeat of the caliphate, until we have the pieces in place to ensure that that defeat is enduring. Nobody is declaring a mission accomplished. Defeating a physical caliphate is one phase of a much longer-term campaign." More financial sense to sell the bombs and methods of delivery to Trump's friends in Saudi Arabia than to deliver them ourselves. PART I : European NATO : United States' Donald Trump is the one who provides those FAKE military news to lie about the Islamic State is defeated, to make Americans think Trump's Heroism but Trump is anti-NATO, pro-Brexit wealthy Brexiteers, we have NEVER hear from his support the Kurdish Independent State as like as Obama-Clinton-Susan Rice 's anti-Kurds airstrikes. PART II : THANK YOU, Kurds : We like to say Thank You and appreciate your Kurdish pro-NATO, pro-Europe's Germany, pro-USA; we think we just have to wait for the 2020 the Republican Presidential Nominee Senator Susan Collins presidency in White House to support the Kurdish Independent State since the previous Obama administration had been hurted the Kurds so much, so much airstrikes. Any greeting, the United States like to say Thank You and appreciation to Kurds, bless the Kurdish community and always be safe. Greeting from the 2020 Senator Susan Collins Committee. If we are withdrawing, we need to give the Kurds some guarantees of protection and make it very clear to Erdogan we mean to enforce them. They deserve it after all these years of fighting with the US.